The church is dedicated to St Cynfarch who was a Welsh chieftan from northern Britain. 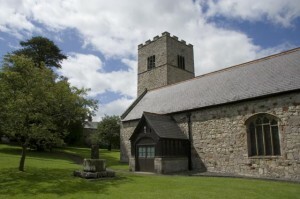 It is a large 15th century double naved church , typical of the Vale of Clwyd. Some interior medieval features remain, including part of a rood screen and a monument to a 14th century Welsh knight. THere is a mosaic of stained glass in the south window which dates from 1503.